I first became a mother at the age of 38 when my husband and I became foster parents to three children under the age of five. Three frightened, angry, fragile kids who spent every waking minute – which, between them, constituted pretty much 24/7 that first year – thinking of creative ways to destroy the house and get on my last nerve. Admittedly, some days were better than others. The days I didn’t get a shower or a square meal – subsisting on goldfish crackers and leftover sips of juice boxes – happened more often than I care to think about, even ten years later. The days I spent scrubbing unmentionable substances off bathroom and even bedroom walls, muttering under my breath about the injustice of it all. Wondering whether I was crazy to think that I had it in me to mother these three rugrats. If motherhood was graded pass-fail, some days I most certainly did not pass muster. I knew, going in, that I was supposed to be changing these kids’ lives. Only gradually did I wake up to the fact that . . . these kids had been given the herculean task of changing me. I was going to have to pass the Mother Test. Now, this test is unlike any other test you will take in your lifetime. It’s not a pass-fail; neither is it based on a 100-point or sliding scale. Rather, it’s a cumulative score accumulated over the course of a lifetime . 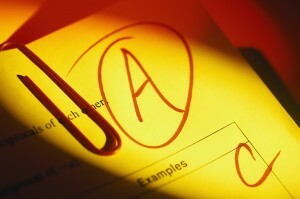 . . with the final grade revealed only in heaven. Sometimes I thought I heard a celestial chuckle. And yet, there was always the hope of a promise, too – a promise that we hear echoed in this week’s second reading. “… Let us hold fast to our confession. Ten years later, now when I lie awake at night, it’s because of the quiet – the oldest child moved onto another home years ago, my daughter is sleeping through the night most nights now, and my son who is living temporarily with another family… well, let’s just say that his absence keeps me awake at night far more often than his presence ever did. Sometimes I miss him so much, my arms ache for wanting to give him a hug. The testing continues. What has been the hardest test for you so far?